Fortnite season 6 is finally here and it's changed up the map quite a bit. Loot Lake has gone, and a brand new consumable is about to change up how you play. 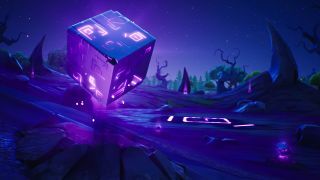 The Fortnite shadow stones are a direct consequence of the cube, and a bit like Hop Rocks, you'll find them littering the map for you to pick up and use. But what do these Fortnite shadow stones do? Well, we've jumped in and found out. You'll find Fortnite shadow stones on the corrupted areas of the new Fortnite map. There are seven in total, all of which are circled on the map above. Thankfully they're pretty obvious from the air, so if you want to get straight on the shadow stone action, you can dive right in. How do Fortnite shadow stones work? Getting a Fortnite shadow stone is one thing, but actually working out how to use it is another entirely. When you consume one of these strange purple glowing cubes, it'll actually turn you almost invisible. The theory is that you're being temporarily sent to some kind of Shadow Realm, but Epic Games hasn't officially confirmed that yet. But, when you're all shadowy you can still move around the map, and actually phase through walls and other objects with the press of a button. A potentially useful little tactic for getting the jump on some unknowing opponents. The entire effect lasts for a fairly lengthy 45 seconds, so you can get quite far from these corrupted areas while still practically invisible. And I say practically, because other players can actually still see you - a kind of smoky purple outline of you anyway - and if they see you, they can shoot you. You can't use any weapons or items, or build anything, while you're feeling the effects of the shadow stone, so you could potentially be a bit of a sitting duck. You're also accompanied by some rather eerie music as you travel. However, if you're moving around while a shadow thing, you are quite hard to see, so it could make for a very interesting mechanic going forward in Fortnite season 6.